The first time you heard of Minsk was probably in FRIENDS when David the Scientist Guy told Phoebe that he’s going there, but mistakingly saying it’s in Russia (Season 1 Episode 10), most likely because not so many people would have heard of Belarus then or known where it is. Even if you’ve heard of Minsk and Belarus before, you probably didn’t hear so many good things about it and wouldn’t be expecting much out of it. At least that was my experience, having been told by a Belarusian how depressing it is and how the country is way behind on living standards or touristic attractions like food quality, accommodation quality, etc. Of course, as a seasoned traveler, I don’t let things I hear determine my judgement of a country before I experience it myself. But I got to say, I was not off to a good start with the visa! Being a Lebanese passport holder but with a work and residence permit in Germany, I was told that getting into Belarus through Minsk National Airport would be a breeze, as foreigners who want to stay in Minsk for up 30 days without a visa will have to travel through Minsk National Airport… That I wouldn’t even need a formal invitation letter from our Belarusian project partner, as I was visiting for business purposes. But when I came to board my flight to Minsk from my layover in Kiev airport on Ukranian Airlines (UIA), I was told otherwise, and denied boarding… And hence started the longest night of my life, of staying in the airport, trying to sleep unsuccessfully, and researching my options while waiting for updates and help from our Belarusian colleagues. It turned out that the problem was that I have an EU residence permit, instead of a multiple-entry Schengen visa, although it is of higher status but the airport crew and the passport control have to follow protocol to the letter. Without a multiple-entry Schengen visa in my passport, I needed an invitation form, called Ходатайство, from the Ministry of Education that basically says I can get a visa-on-entry when I arrive to Minsk airport. 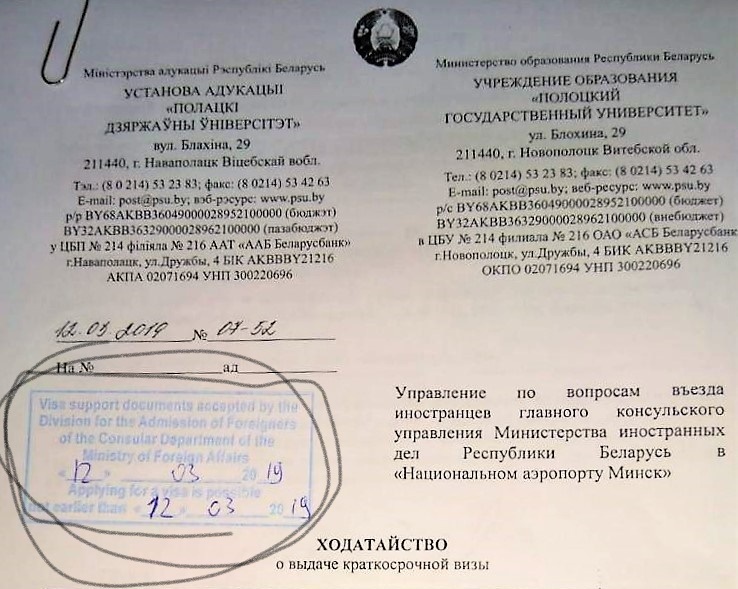 This document with the stamp, for a formal visa request, is crucial for the flight crew to see if they were to allow you to board to Minsk airport. Of course, when I first got that form through email, and showed it to UIA boarding crew, and was told I can be granted the right to board, I thought that’s it… That’s the visa. I made it. Little did I know that I would still have to go through the real visa process once I get to Minsk Airport, which involved filling an application (which wasn’t too hard), taking biometric photos with an ancient photo booth that has terrible quality photos (better always carry your own!) which cost 10 BYN (Belarusian Rubbles), almost 4 EUR, and paying 90 EUROS for a single entry visa for a week. They do take payment in Euros, and there is an ATM right there by the desk that gives out multiple currencies just in case. If you’re wondering if that just happened to me because I have a Lebanese passport, it also happened to my colleague that joined our trip, and has a Jamaican passport with even a permanent Spanish residency. Additionally, all arriving visitors will have to purchase obligatory medical insurance that is right at the passport control checkpoint but is quite cheap, and depends on how long you are staying in the country. For example, I had to pay 6 Euros for a week visit. And right when I thought I was ready to go through the control, the office tells me that I have to wait for an officer who will just come ask me some routine questions about my visit. Luckily I had my Belarusian colleague with me and he helped with the translation, because as you will find, not so many officials speak English that well. So basically, unless you’re an EU citizen or has a tourist Schengen visa on your passport, you’ll have to go through this. Keep in mind, that you will also need to be registered at the local police station for the duration of your visit. Your hotel will register you, and when you check out, they’ll provide you with a small piece of paper with your stay dates that you will need to show to passport control when you are exiting the country. Normally, you need to register for the entire duration of your stay if you stay for more than 5 days; in my case, I was staying at the hotel for 5 days, and then for 2 nights on my own, but did not have to re-register since I was leaving on a Sunday, but had I stayed for longer or wasn’t leaving on a Sunday (which is excluded from registration), I would have had to pay a fine. Now that I finally got through the checkpoint and into Minsk, into my comfortable bed in the nice Monstrasky hotel, let’s get to the fun part! I'm not one to care much about the accommodation in the city I'm visiting since it's just a matter of having a clean bed to sleep in for a few hours in the night, but after the stress and trouble I went through in the past few days on my way from Emden to #Minsk, I am happy to be staying at this very #beautiful and peaceful hotel, aptly so because it is a renovated monestary! What's the most important factor for you in the accommodation you choose to stay in? Other than cleanliness of course. Walking around the city was quite a sight for the eyes. You get to see interesting architecture, without being overwhelmed by high-rise buildings or a lot of “copy-paste” buildings. You’ll come across some beautiful catholic churches, soviet governmental buildings like the KGB, statues spread across the city including the famous Lenin statue, quaint residential buildings, and many other buildings that stood out like the National Academic Bolshoi Opera and Ballet Theatre, the Belarusian State Circus, the National Library of Belarus (which lights up quite interestingly at night), etc. One added motive to exploring the city is the cheap and convenient transportation means. You have metros across the city, although I didn’t have the chance to take one. You have taxis on call, which are much more affordable than getting them off the street (your hotel can call them for you, and their details are in the business card in the image gallery below), and also trains that are for as low as 25 cents that can take you outside of the city (but don’t expect anything fancy haha). Apparently the city is quite known for its cleanliness, not that I heard about that before I was there. So it was quite a nice surprise! Compared to some very fancy European cities like Paris, there was absolutely no trash or littering anywhere to be found around Minsk. There were no beggars or street vendors pushing touristic stuff on you, so walking around the city is quite a peaceful experience, especially when you go through the quaint cozy quarters that are spread across the city. When you do want to buy memorabilia, you will find them in different cute kiosks or inside the popular local department stores ГУМ (Gum) and ЦУМ (Zum) that have a variety of items. Although I wasn’t in the best mindset, having been sick throughout my trip in Minsk, I still couldn’t miss going to the National Academic Bolshoi Opera and Ballet Theatre for The Flying Dutchman Opera. The fact that a ticket only cost 7 EUR didn’t deter me from pushing myself to make it at least through half of the performance, even though I barely understood anything with a German opera and Russian subtitles. The performance was quite professional and high class, and the theater itself was quite beautiful… You can hardly believe the ticket cost less than a movie ticket at a German cinema theater. So you’d have no excuse not to dress up all fancy and spend a classy cultural evening in Minsk! For another taste of arts and culture, be sure to take a stroll in the arts quarters to enjoy some very colorful murals, one of which a local claimed to be the biggest mural in the world haha, art galleries and exhibitions, and graffitti by Brazilian artists, part of the Brazilian Urban Art festival, Vulica Brasil, that takes place in that street every year. I was also told prior to my visit that food options can be limited in Minsk, but that wasn’t the case at all. There were plenty of highly rated restaurants to choose from, from different cuisines such as Italian, Asian, Georgian… In fact, finding good Belarusian cuisine was the trickiest part, but again, I was very sick and couldn’t manage to explore enough to reach any. Prices also range from cheap to pricey, depending on what you’re looking for. For example, a 3 course lunch at Milano Cafe, with big portions and delicious food, cost 20 BYN (about 10 EUR) which can be pricey by local standards but is quite a catch by Western European standards for examples. Cheaper options are also available, without sacrificing taste and quality, at Georgian restaurants like that seemed quite popular with the youngsters. You can watch video updates about all the above and more interesting things from around Minsk in my Instagram highlights, as well as highlights from many other locations. I wouldn’t say I am the most well-traveled person, but I get around often, especially around Europe since I moved to Germany… I started traveling for leisure and business when I was 25, and since then, I’ve been to 34 countries. Not bad, eh?! Sometimes, it is difficult for me to recall the details of all the places I’ve been to, while others are engraved in my memory. While it is hard to rank them from best to worst, or most to least favorite, I figured a good place to start is to single out my top favorites starting with budget traveling…. Which is my favorite mode of traveling, because you get a more authentic experience of the local life (plus I can be kind of thrifty lol). Wouldn’t you agree?! Check out more photos of nuwara eliya in my facebook album. Sri Lanka was my first ever solo trip for leisure, in 2012, where I backpacked across the island in 12 days, passing through Negombo, Colombo, Galle, Mirissa, Katharagama, Arugam Bay, Passikudah bay, Kandy, Sigiriyah, and Nuwara Eliya. I always recommend it to those looking for exquisite nature, adventure, friendly locals, and a variety of experiences on a budget. Of all the towns I visited in Sri Lanka, Nuwara Eliya was a different and unexpected experience that I even extended my stay. The freezing temperatures were also a nice escape from the humid hot weather that’s generally around the coast. I was surprised to see its beautiful colonial architecture, which is why it’s called “Little England”, amidst lush green nature and endless tea plantations… Naturally, as a tea addict, I felt at home! 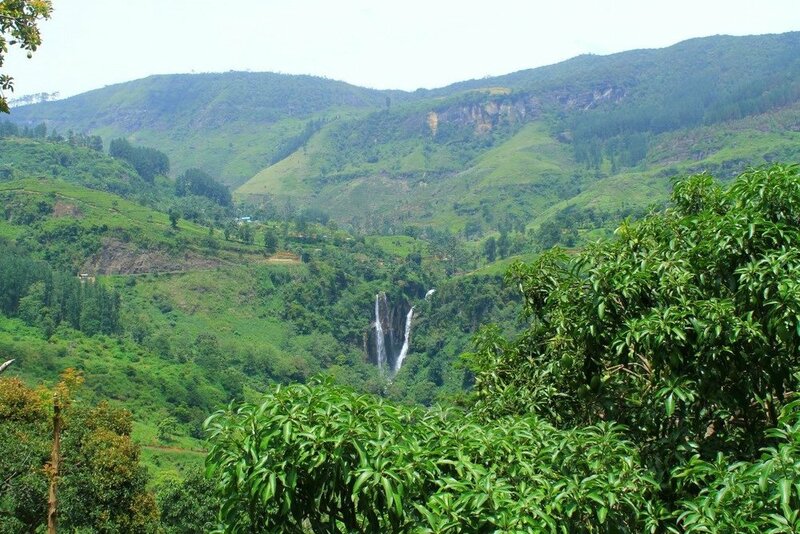 Around Nuwara Eliya, you can also visit “Little New Zealand” to see dairy farms, get some fresh dairy products, and even strawberry plantations and cute cafes with delicious local produce. Read more about my Sri Lanka trip in my blog post: Around Sri Lanka In 2 Weeks - Part III. Activities in the area: Tea factories and plantations tour, hiking Adam’s Peak, and white water rafting. You can see more photos of my trip in india in my facebook album. It is no wonder that Alleppey's backwater canals have been named by National Geographic Traveller in the top “50 destinations of a lifetime”, and I got to experience that myself! Kayaking through these canals was such a beautiful serene experience where we were able to see the locals and interact with them (mostly because I was waving and saying hi to everyone like I actually knew them lol), and also spot different types of exotic birds... A disclosure here is that I wasn’t in India on a budget trip, but a sponsored luxury trip, which was beyond my expectations in all facets, and is highly recommended. I got so spoiled that European luxury can not impress me with how mediocre it is in comparison to Asian luxury (more on that in an upcoming post!). Still, Going to Alleppey was actually not on the itinerary; I had read about it and felt so compelled to go for the experience and pay for it myself. I am so glad I did not miss that chance! You can read more about my trip in Kerala in my blog post: Kerala, India: Experience Raw Nature In Style With Gateway Malabar Holidays. Activities in the area: Kayaking, boat rides, spas, and Marari beach. You can see more photos of my trip in Malaysia in my facebook album. Are you starting to see a pattern here? Yes, my favorite budget destinations so far are all in South East Asia, and they’re all about gorgeous nature and adventure! Langkawi in Malaysia definitely stood out for me because it was like a compact of my Sri Lankan experience, where you don’t need more than a couple of days to take it all in, but you’ll probably enjoy it so much you’ll want to stay longer! As a bonus, it also has delicious local food ranging from street food, weekly farmers’ market, to seafood restaurants. Of course, another reason I loved Langkawi is that I actually got to meet a Facebook friend who is a local there, who was just the sweetest ever, took me around the island on her scooter! Activities in the area: Beaches (duh! ), tandem paragliding, cable ride, and a zoo. Rila mountains and monastery in Bulgaria, which didn’t make the cut because I was too sick and tired to explore its famous seven lakes so that’s my bad. Still, breathtaking nature and delicious local food without being overrun by tourists makes it worth the mention and a visit! After all the running around for a week in #Italy, and flying to #Bulgaria so early, and spending almost all day in transit to get to our lodge in the mountains by #rilalakes, I decided I just wanted to chill and breathe in the mountain air... Also, the rainy and cold weather wasn't so encouraging to go out exploring. I just wanted to cozy up by the lodge fireplace with some hot tea, and then sleep in till afternoon... And I did just that! Then I was ready to go out for a slow walk in the mountain. No fuss. No pain. Sometimes, slowing down is an important part of the adventure. How do you "slow down" and pamper yourself? Nis in Serbia, which didn’t make the cut because I didn’t stay there long enough to be able to explore activities that I might like. It was the end of a 12 days trip, and I was beat. Still, Niskabanja park is worth a mention and a visit! The sun sets on our 2 weeks vacation, in the charming city of #Nis, #Serbia and it couldn't have been anywhere better. Walking around feeling like a local, among locals and barely any tourists... We decided to spend the last day in the peaceful #niskabanja, a popular getaway for the city dwellers, famous for its park with thermal pools, and its scenic views of the #Balkan mountains. For such a little town, there are also tons of things to see in its #green lush #nature and even some #adventure activities like paragliding. But for our last day, we just wanted to chill, breathe in, and end the trip in serenity... And for that, Niska Banja was the perfect spot, especially as we were blessed with #beautiful weather. What was your favorite part of my trip? Which city would you want to visit? You can check out the highlights of each city in my #instagramstories if you've missed any! Have you been to any of these cities/countries? Would any of these make it to your list of top budget destinations?! Let me know in the comments! When I first said that I was traveling to Kerala in India, I was warned about the food, the weather and the crowdedness… Very few people, including me, really knew Kerala and what to expect! I assure you that your misconceptions will change, just like mine has, when you experience Kerala like I did… So read on to know how best to explore the marvelous state known for being God’s Own Country… In style! It was in Crowne Plaza Kochi that I also had the best food in my trip: A specially made sea food course with coconut milk and coconut butter flavor! So you may not want to stay around in Kochi for more than 2 nights on your way in and out of the state, and if you’ve got time, do visit the Fort Kochi area for some touristic shopping and chill time at a street café. On the way out of Kochi, and to the high ranges of Kerala, is where you start to see the beauty of the state… Munnar was my next stop in Kerala, around 4 hours away from Kochi, high up in the mountains, surrounded by luscious jungles. I stayed at Mountain Club Resort, with a gorgeous view from the room and a relaxing natural ambiance, I really thought I’d not see anything more beautiful during my trip; but oh how I was wrong! Kerala kept amazing me with its beauty. The resort is about 20 minutes far from the town, in the heart of Munnar’s vibrant nature and away from the crowdedness so you can truly relax. There are many activities at the resort such as swimming at the infinity pool, having fun at the recreation room or getting pampered at the spa, and when you finally feel ready for adventures, the resort can arrange lots of outdoor activities for you such as ATV rides (at Polaris around 3km away from the resort), biking, wildlife safaris and much more. I chose to go ATV riding, and I was so glad I did, not only because it was lots of fun, but because I was able to get to the lake I was seeing from my room view, and it was the most peaceful serene scene in my trip! Munnar is known for its lakes, most famous of which is Mattupetty Lake at Echo Point, its waterfalls and tea plantations… Miles upon miles of green mountain fields that just fill you with awe. As a tea addict, I of course couldn’t leave Munnar without stocking up on delicious natural fresh tea! Another 3 to 4 hours away to the south of Munnar, I got to Thekkady, to my stay in Greenwoods Resort and it was beyond expectations! No wonder it is rated as #2 hotel in Thekkady on TripAdvisor. I had the presidential suite and I could have easily not left my suite ever and still would have been overwhelmed! A 2 stories suite with its own private heated swimming pool and a Jacuzzi, surrounded by jungle… There is nothing like swimming in warm water, while it is raining, and seeing squirrels scurrying around the majestic green trees around. The whole resort is built in a jungle on top of a hill, so it’s like living in a jungle but in a 5-star style… And if you really want to experience an authentic jungle living, they actually have a tree house on the premise, where you can sit back and enjoy a cup of tea & homemade cake on top of a tree! Apart from the awesomeness of the resort facilities, the staff was extremely pleasant, attentive and professional, and the chef took special care of me when he knew I don’t eat spicy food, preparing food especially for me, even though there were already plenty of delicious choices with live cooking stations. The resort’s location is strategic, as it is just a walk away from the local market where you can experience local life and shop for local products, and visit the offices of major attractions to get tickets, but the resort can also arrange them for you. Elephant rides, boat rides, cultural shows and dances, jungle treks and bamboo rafting, jeep safari tours are just a few of the awesome activities you can do in Thekkady… You wouldn’t know where to start! I surely went for an elephant ride, for the first time ever, and for the jungle trekking to explore the rich nature of Thekkady, and bamboo rafting in a serene lake surrounded by wildlife and exotic birds. Bamboo Rafting after Jungle Trekking in Thekkady, Kerala, India. But if you really want to learn about Kerala’s nature and ecosystem, without going through the fuss of a jungle trek, then I recommend visiting the Spice Village Resort. A tour inside the resort with one of its naturalists will introduce you to the many types of trees, plants, and herbs that Kerala is famous for; you may even spot some exotic birds too! Although you can never have enough of the beauty of Kerala’s highrange, but you do not want to miss the chance to see the state’s famous backwaters and beaches! I left Thekkady and headed to Kumarakom, about a 3 hour drive towards the west coast. Kumarakom is a village that’s more of a cluster of little islands, therefore known for its vast network of rivers and canals. You can experience the best of Kumarakom by staying at Zuri resort, with a scenic view of the beautiful backwaters, which you can also enjoy through the resort’s luxury houseboat ride. But to really enjoy the backwaters, you must not miss the chance to go kayaking in Alappuzha (aka Alleppey)! 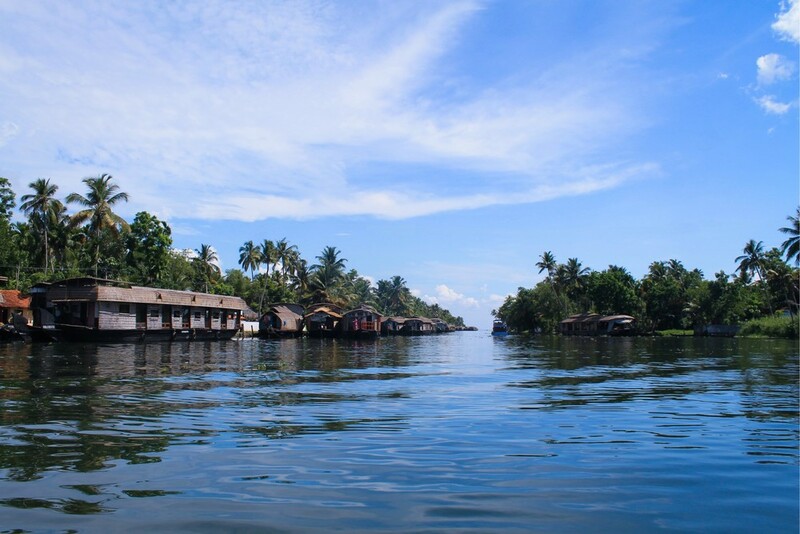 Nicknamed “Venice of the East”, and listed by National Geographic Traveller as one of the top 50 destinations of a lifetime, it is the perfect opportunity to explore the beauty of the backwaters while also witnessing the daily lives of locals who fish, bathe, buy fish and water, do laundry and dishes by the sides of the canals. Then head to Mararikulam, where I saw one of the most breathtaking beach sunsets at the eco-friendly Marari Beach Resort; I just shut down everything and relaxed on the beach, soaking in the sun rays, and watching fishermen throw their nets into the waves for the catch of the day. I later got to have that fresh catch of the day at the resort’s seafood restaurant, The Beach Grill, where the chef prepared it live in front of me; I then enjoyed my delicious dinner by candlelight while listening to the soothing sounds of the crashing waves… It was the perfect ending to my amazing experience in Kerala; truly God’s Own Country. Sunset at marari beach, kerala, india. Disclosure: My trip was sponsored by Gateway Malabar Holidays who arranged my exquisite accommodations and transportation with a local Arabic/English speaking guide, and ensured my utmost comfort for a smooth and pleasant journey throughout. batu caves; kuala lumpur, malaysia. paragliding at cenang beach, langkawi, malaysia.